Tile is one of the universal options for flooring, but often a significant drawback hinders your choice of it - if in summer a pleasant coolness comes from the tile, then in winter it is at least uncomfortable to walk on it, especially after shower or bath. The simplest solution to the problem is to install a heated floor under the tile, but which one of the best solutions on the market is suitable for this, you need to look at the individual conditions. Hot water and electricity can be sources of heat for flooring. 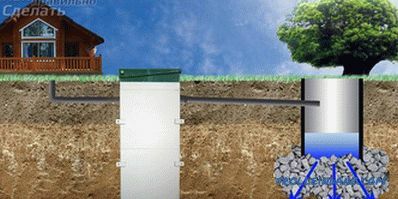 In the first case, water pipes are used that are mounted in the thickness of the floor, and among the electrical devices there are heating cables, mats and film underfloor heating. Which is better to choose a warm floor under the tile has to be decided on the basis of not only the cost of installation and operation - much depends on whether it is settled in the apartment or in a private house. Despite the large number of advantages, clearly this option is not for an apartment. Even if you do not take into account all the difficulties with the calculations of such a system and installation, to install a water heated floor in an apartment in a high-rise building you will have to obtain such a number of permits that this idea is unlikely to seem correct. 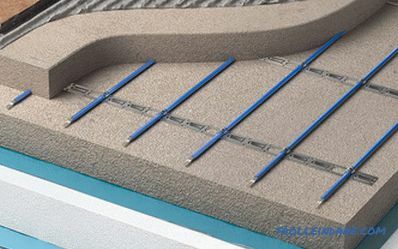 A water-heated floor consists of a substrate with thermal insulating characteristics on the surface of which a pipe system is mounted, immersed in a thick screed. It is forbidden to connect it to the central heating system - if do such a scheme in the apartment, then it should work from an autonomous boiler. 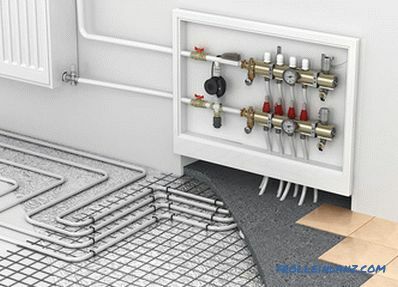 Design and installation of a water heated floor require special knowledge - if not, then amateur activity will, at best, lead to large heat losses, and consequently to inefficient system operation in general. The whole construction requires the manufacture of a sufficiently thick tie - this is one of the reasons for the prohibition of mounting it in apartments, as well as in houses with weak interfloor overlappings. Large thermal inertia - there is no possibility of fine adjustment of the temperature or switching off part of the room. For example, if you mount a warm floor, and then put a cabinet in one place, then the surface under it will still warm up. Only the entire room can be disconnected from heating, depending on the capabilities of the collector used. Best of all, a water-heated floor manifests itself in the heating of large areas - if you do it for a small room, the efficiency will leave much to be desired. For any breakage, you will have to break the tie for physical access to the pipes. Therefore, it is strongly not recommended to install inexpensive components. Even if an autonomous heating system is already installed in the house, the underfloor heating will put additional load on it - if the boiler's power has been picked up "back to back", then it will have to be changed. As a result, a water-heated floor can be used under a tile, but it is advisable to use it in a private house with a large area and an autonomous heating system. In this case, it is best to mount it at the construction stage - otherwise large-scale repair work will be required, there will be a lot of dust and dirt. No reference to the main heating. If it is necessary in the autumn or spring to warm the tiles in the bathroom, then do not drown the boiler. An additional screed is either not needed at all, or a sufficient leveling layer with a maximum thickness of 30 mm is sufficient. Calculation and installation is much simpler and takes an order of magnitude less time. More customization and adjustment options. Even if the heating wire deteriorates, the water will not spill over the neighbors or will not go to the foundation. 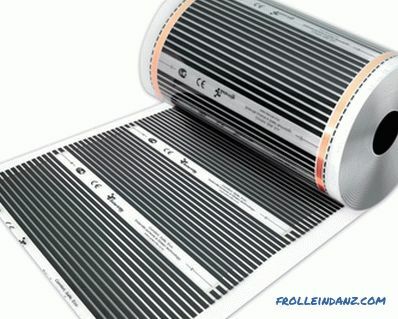 This is one of the most reliable solutions for floor heating. The principle of installation is quite simple - a cable is laid on a prepared surface with a snake and fixed with special clips or mounting tape. Under preparation means laying insulation with a reflector (foil with cork or polypropylene), so that the heat does not go to the floor, and was given to the surface.Then, sensors are installed at the calculated location and you can proceed to laying the finishing coating. Any glue is much more expensive than the material used to make the screed - this is at least an uneconomical solution. If over time it is necessary to replace a tile or its part, then at its dismantle there is a probability to damage a heating wire. 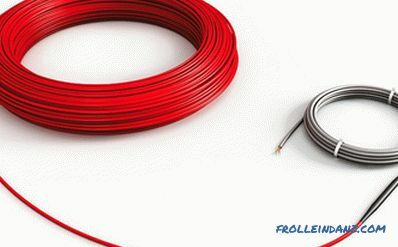 The heating cable is very convenient to install - it easily bypasses all obstacles, for example, the toilet in the toilet or bathroom, but it is very likely that you will need expert help in calculating the optimal length of the wire, although with this always help in the store. However, it is necessary to lay it in a layer of cement-sand screed with a thickness of 30-40 mm, and only then on the screed, lay the tile with glue. In essence, this is the same heating cable, but already prepared for installation. He is still at the factory secured to the mounting grid, which is wound into a roll. Due to this, there is no need for additional calculations, since the power of individual thermomats is already known - all that remains is to pack and connect them. 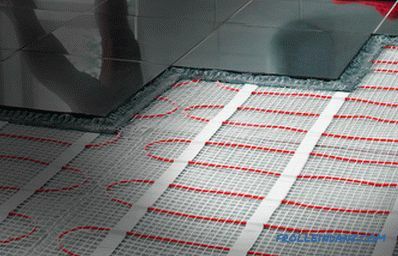 Since the thermomata cable is already attached to the protective net, there is no need for an additional screed - tiled glue can be applied directly to the mats and tile laid on it. If you want to play it safe in case of tile replacement, you can pour thermomats with a self-leveling mixture 3-4 mm thick, but manufacturers do not insist on this procedure. 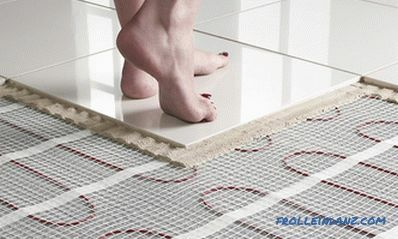 The heating mat is a good solution for arranging under floor heating, because there is no need for additional screed. The second name of this heating element is infrared heat-insulated floor, although for all heaters the majority of thermal energy is released in this range. Initially, such films were developed for laying under laminate, linoleum, similar dry coatings, or simply under the carpet. They can also be mounted using the “wet” method under the tile, but in this case, quite serious surface preparation is required - installing a rigid, even base and a waterproofing layer (usually made of plasterboard and polymers) over the top of the film. As a result, the costs of materials and time are greater than when using cables or finished thermomats. Therefore, the film is unlikely to be characterized as the best floor heating under the tile, rather, on the contrary, the use of this heated floor under the tile should be abandoned. Also, the disadvantages of the films include the lack of grounding - therefore, their installation in rooms where at least theoretically high humidity may not be allowed. There are several well-established trademarks on the market that offer customers high-quality products manufactured according to European technologies and equipment supplied by time-tested manufacturers. In addition to adopting foreign experience, domestic companies are actively introducing their own developments, which allows them to put competitive products on the market at reasonable prices. The original name of the trademark owner is Thermo Industri AB, headquartered in Stockholm. In Russia there is one of the industrial enterprises, whose products are distributed by the official representative office of Thermo AB. In Russia and the CIS countries, the trademark has been known since 1991. In the domestic market of heating devices and equipment, it is, in fact, one of the creators of the segment of warm electric floors. The width of the range and its constant availability on the market is ensured by its own production facilities and a vehicle fleet, which supplies products to stores and distributors throughout Russia, to the CIS and Baltic countries. 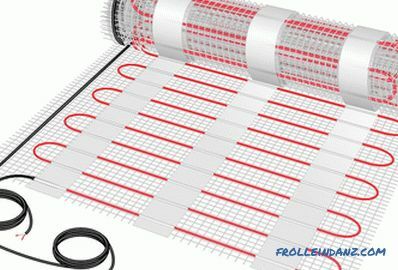 The factory produces all the necessary components to create an electric floor heating. Among the product names there are several types of heating cable, allowing you to choose the load for rooms with different area and temperature conditions. Branded regulators allow the most efficient use of electricity and set the optimum operating mode of the equipment. Heating sensors prevent overheating of wires and allow you to control their temperature with an accuracy of one degree. In order not to spend a lot of time on counting the number of wires required for a specific room, in the company's catalogs there are already calculated standard options that will give an overview of the required amount of material. Based on these data, it will be easy to calculate the final figures. 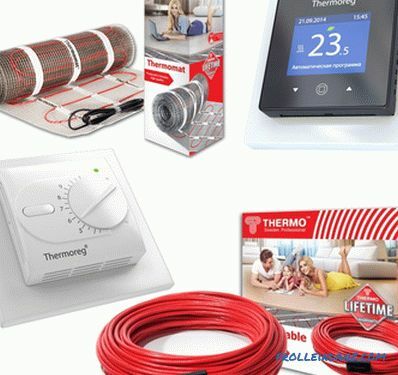 Thermo heating cables and mats can be used not only indoors - some of the company's products are designed for heating objects that are outdoors. The use of this technology will allow you not to worry about the frost that can form on the steps or the porch. Surface icing is controlled by separate sensors, so that wasted heating will not work. If you need to choose an electric floor heating under the tile, this will be one of the first brands that catches the eye. Its owner is the group of companies "Special systems and technologies" - a domestic manufacturer of equipment and components for the installation of electric underfloor heating. Focused primarily on the market of Russia, Belarus, Ukraine, Kazakhstan and other CIS countries. The company's production facilities are located in the Moscow region and can boast the title of the largest European manufacturer of heating cables and the associated thermostatic filling, which is necessary for the quality of industrial and domestic heating cables. Automated equipment is used for production by such companies that have long proven in the industry as Spirka, Dunst, Kuhne, Nokia and Rosendahl. It is housed in workshops with a total area of ​​almost 15 thousand m² and allows you to produce up to 400 different types of heating cables, which are of high quality and long service life, even in wet rooms. 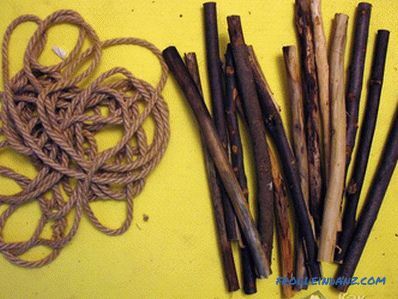 This is made possible through the use of a twin-shielded braid. For laying the cable under the tile produced a mixture of "Thermolux Glims", which protects it from possible mechanical damage. According to the manufacturer's catalog, you can choose a heated floor for any room in terms of size and temperature conditions. If the room is small, then the optimal choice would be the “Thermolux Mini” model, and for those requiring enhanced heating of the rooms - the “Thermolux Tropix”, with increased heat emission. For all its products, the company gives a guarantee of 20, and the total service life is determined by the manufacturer in 50 years. Domestic trademark owned by the group of companies "Special systems and technologies", with headquarters in outskirts of Moscow. The foundation date is 1991 - since then, the company's production capacity has expanded significantly, resulting in new complexes in Mytishchi and Ivanteevka, equipped with modern lines for the production of cable and wire products. The company's specialists are engaged not only in production - a significant part of the effort is directed to the design of new heating systems. Continuing work in this direction allowed engineers to accumulate a unique experience in solving non-traditional tasks. Often, the assigned tasks are carried out due to our own developments, which are later used for the mass production of heating products. 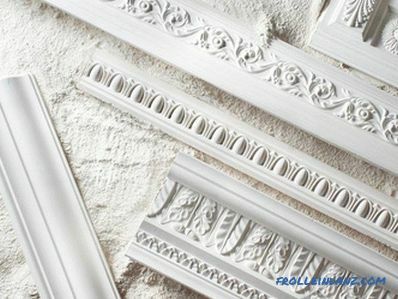 It is not only the quality of the materials used that determines the durability and efficiency of all products. To create an optimal engineering solution, all developments go through several stages of production: calculation, all sorts of tests, and only after that - the launch into the series. Continuous development is the key to maintaining a high level of quality established in the company. Tight quality standards and the expanding field of high-tech research allow us to guarantee the long-term service life of equipment to the end customer, and an extensive network of dealerships - convenient service and warranty service. A selection of manufacturers was carried out on the basis of reviews, opinions and ratings of users placed on various resources on the Internet. All information is taken from public sources. We do not cooperate with manufacturers and trademarks and do not call for the purchase of certain products. The article is informative. 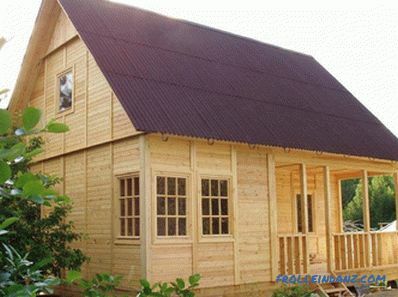 How much does it cost to build a garden house?